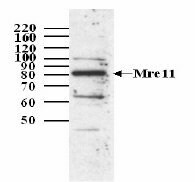 Synthetic peptide (Human) - which represents a portion of Meiotic Recombination 11 (Mre 11)encoded within exon 3. Our Abpromise guarantee covers the use of ab3621 in the following tested applications. WB 1/1000 - 1/5000. Detects a band of approximately 81 kDa (predicted molecular weight: 81 kDa). Immunohistochemistry (Formalin/PFA-fixed paraffin-embedded sections) analysis of human breast carcinoma tissue labelling Mre11 with ab3621 at 1/1000 (1µg/ml). Detection: DAB. Publishing research using ab3621? Please let us know so that we can cite the reference in this datasheet. I'm interested in your anti-Mre11 antibody (ab3621). I would want to know the targeted sequence in the human protein, please. If it were propietary, could you help me by performing a BLASTp of the recognized epitope with the bovine MRE11A (NM_001192605.1) and then send me the results of the matching as % max ident, % positives, and number of gaps, please. We want to assure that your antibody will accurately cross-react with the bovine protein. Thank you for your enquiry regarding ab3621. I can confirm that ab3621 was produced using a peptide identical for human and bovine. Since its cross-reactivity has not been tested with bovine (only on human samples) this is an untested species and we do not guarantee it yet. I could offer you a discount code for testing if you wish to test one. The Terms and Conditions of this offer can be found at: https://www.abcam.com/collaborationdiscount. 1. Reply to this e-mail to let me know that you would like to proceed and testab3621 in bovine. I will then send a discount code. This code must be issued before purchasingab3621 so please wait for my reply before ordering. 2. Purchaseab3621 either by phone, fax, or online (www.abcam.com). We are always pleased to obtain feedback about our products and any information is greatly appreciated! Even ifab3621 turns out to be unsuitable for bovine, you will still receive the discount on your next purchase after your Abreview has been submitted.